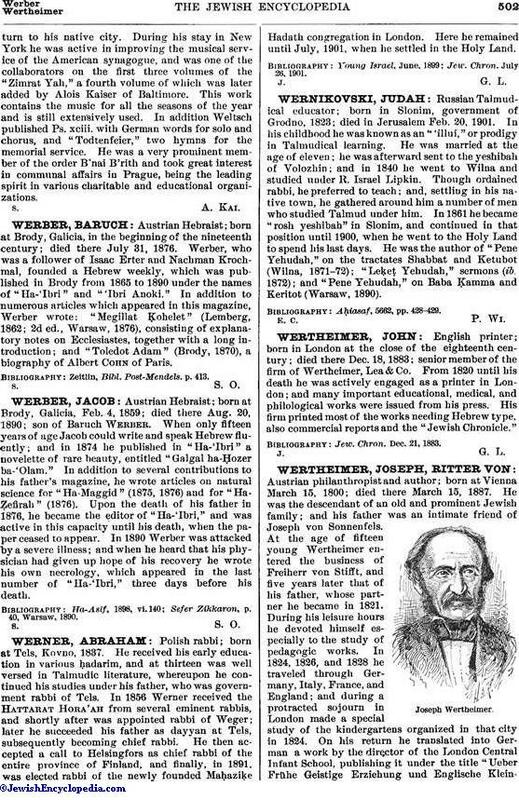 Austrian Hebraist; born at Brody, Galicia, Feb. 4, 1859; died there Aug. 20, 1890; son of Baruch Werber. When only fifteen years of age Jacob could write and speak Hebrew fluently; and in 1874 he published in "Ha-'Ibri" a novelette of rare beauty, entitled "Galgal ha-Ḥozer ba-'Olam." In addition to several contributions to his father's magazine, he wrote articles on natural science for "Ha-Maggid" (1875, 1876) and for "Ha-Ẓefirah" (1876). Upon the death of his father in 1876, he became the editor of "Ha-'Ibri," and was active in this capacity until his death, when the paper ceased to appear. In 1890 Werber was attacked by a severe illness; and when he heard that his physician had given up hope of his recovery he wrote his own necrology, which appeared in the last number of "Ha-'Ibri," three days before his death. Sefer Zikkaron, p. 40, Warsaw, 1890.